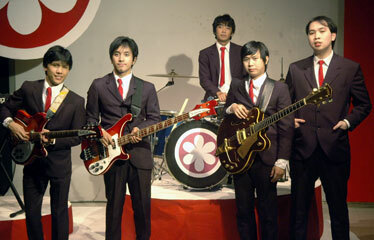 The Bloomfields, from Manila, will perform 1960s rock Sunday at "Freedom Bash," a celebration of Filipino independence. Dig out those miniskirts, go-go boots and tie-dyed Ts (the bouffant do is your call). Get ready to travel back in time to the swinging era of the '60s, courtesy of the Philippine Consulate General and the Philippines Celebrations Coordinating Committee of Hawaii. In honor of the 109th anniversary of the Proclamation of Philippine Independence, Philippine Consulate Ariel Abadilla and the PCCCH are celebrating with a dinner, though this year the generally formal occasion will have a slightly new twist, a theme dinner and dance concert called Freedom Bash. Participants are encouraged to attend in their finest '60s-inspired attire and prizes will be given out for the most original and creative costuming, as well as for winners of the dance contest. Freedom Bash is a part of Freedom Fest, a series of events that kicked off with the Honolulu Festival and comes to a close on Tuesday. The PCCCH primarily puts on two big functions a year: celebrating Filipino independence on June 12 and a Christmas celebration. For Sunday night's bash, the band the Bloomfields has been brought in from Manila. A group of 25-year-olds specializing in '60s American-style rock 'n' roll, the five-piece got their start playing alternative and punk music as high school students at La Salle Green Hills in the country's capital. Their repertoire includes songs by the Beach Boys and the Four Freshmen. "We're going to make a little variation on the formal event," Abadilla said. "Every year, Filipino communities outside the Philippines (recognize the anniversary). ... This year, it's not going to be just a dinner and speeches, but also we'll have the expertise of Filipino artists. Filipinos are also well known for their talent (and) the Bloomfields are such a hip band in Manila. "The Bloomfields sound so American for a Filipino band. They may be young, but they have a musical artistry that rivals the old." The idea for Freedom Bash was inspired by the sounds of the retro band. Besides the fashion and social freedoms associated with the often turbulent 1960s, Abadilla said Freedom Bash has a second connotation, freedom from colonization that the Philippines went through with Spain and the U.S.
"The time in the '60s was more progressive. During that time, the Philippines was the second most progressive country in Asia after Japan. ... The '60s was a decade of spirit, of freedom, of expression, peace. ... It's the right of Filipinos to get freedom."